You look for clothes that are a little different. That's why this top caught your eye. 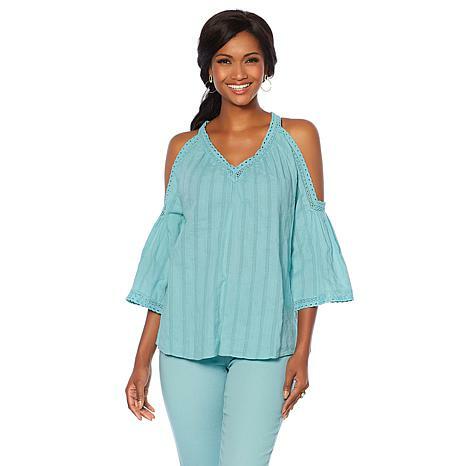 From the pretty texture and crochet trim to the deeply cutout shoulders, it's not your run-of-the-mill blouse. 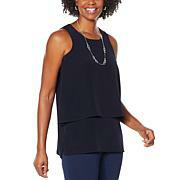 The cotton-blend fabric and loose fit are welcome when it's warm outside — you'll feel the breeze and look fabulous. 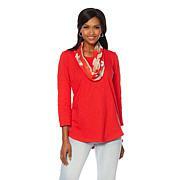 This is a beautiful blouse love the shoulder cut out . I order the white one looks good in jeans and sandals or hills . Love it that I will order the navy blue . GET THIS WHILE IT'S HOT & YOUR WEATHER IS NOT! What a fantastic price for a spring/summer top! I have read the reviews and I am familiar with DG2 sizing. I usually size down and with this I got my true size of 1x and I am glad I did. 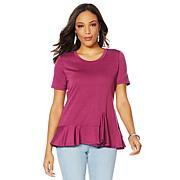 Being a cotton top, it is great for hot Florida and I purchased the lilac and will go back for the other colors as they are still available in my size. It does run on the short side and I think I will size up to the 2x, either will fit. I am 5'4" and DG tops usually run big not this.